Lord Ramachandra ruled the earth as the ideal king more than two million years ago. 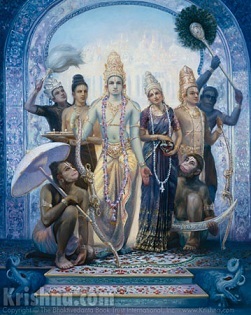 Under the order of His father, Maharaja Dasarath, Lord Ramachandra lived in exile in the forest for fourteen years, along with His wife, Sita Devi, and His younger brother, Lakshmana. After the powerful demon Ravana kidnapped His wife, Lord Ramachandra rescued her, with the help of His faithful servant Hanuman, and killed Ravana along with Ravana's armies. The history of Lord Ramachandra's pastimes is recounted by the sage Valmiki in his Ramayana.